I'm presenting this tasting note today as a public service. If you're thinking about ringing in the Teens tonight in high style, this might be useful. If not, please drink vicariously responsibly. There are days when it's good to go to work. Cracking open a bottle of Cristal is one of those -- and not just because it's delicious. When I worked at a major newspaper, we tasted dozens of wines every week, but the only wine I recall every food writer begging to sample was Cristal. People hear that Jay-Z is boycotting it, or that P. Diddy tried to buy every bottle in Arizona for a Super Bowl party, and naturally they're curious. What's all the fuss about? Partly it's the hope of living like the superstars from the supermarket tabloids. But there's also some anticipatory schadenfreude. Most people don't want to drop $200 on a bottle of Champagne at a retail store, or maybe 3 times that in a nightclub. It would be better overall if people could have a single sip, say, "Ah, Two Buck Chuck is just as good," and live the rest of their lives satisfied with their lot. I wish I could give everyone that comfort. But I have to tell you, this is a great wine, even more so because it's easy for anyone to appreciate. 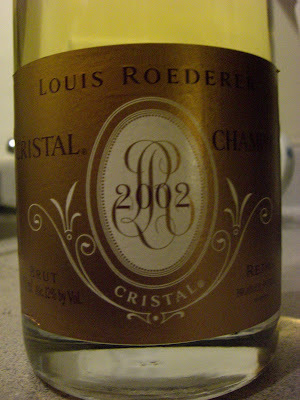 Plenty of people who buy Cristal couldn't care less about terroir, minerality, balance, etc. They want a great-tasting wine, and Cristal really delivers. The aromas are of golden pear, wheat toast, Pippin apple, pine resin, and raisins both black and golden. The first taste is ripe golden pear that shifts to slightly tart apple, sweetening to Fuji apple on the lengthy finish. There's a toastiness behind the fruit that adds gravitas, and the finish will please the serious wine fan, but mainly it's exuberant. I was amazed, then remorseful, at how quickly my bottle emptied.